Semi-automatic cappers are designed to tighten the cap on a container or bottle but require an operator to place the cap on the bottle. Semi-automatic cappers are designed needing different levels of operator involvement. The most simple semi-automatic cappers, often called hand held cappers or manual assist cappers, require the operator to place the cap on the container, hold the container, bring the hand held capper in touch with the cap, and activate the hand held capper. (Hand held cappers are approximately the size of a powered screw driver.) At the other extreme of semi-automatic cappers are spindle cappers, often called retorquers. Semi-automatic spindle cappers require the operator to only place the cap on the container while the spindle capper automatically handles the remainder of the capping operation. Single head chuck cappers can also be used as semi-automatic cappers. Semi-automatic chuck cappers are designed with a single chuck. Semi-automatic chuck cappers require an operator to place the cap on the container and to place the container below the chuck. The chuck on the semi-automatic capper is then lowered by the operator to make contact with the cap and tighten the cap on the container. Once the proper amount of torque is applied to the cap, the chuck on the semi-automatic capper releases the cap. Chucks are designed to “sense” the amount of torque that is applied to the cap. The sensing of torque is often done pneumatically or mechanically, and the chucks can be adjusted to apply different amounts of torque. Chucks are specifically designed for the size cap that they are applying. For different size caps, different size chucks need to be installed on the semi-automatic capper. Kaps All Model FE4, semi-automatic, 2 station, 4 spindle, stainless steel, cap retorquer rated from 5 to 90 containers per minute – depending on materials, application and operator dexterity. Cap size range: 8mm to 70mm and capable of handling most types of caps. Container size range: 1oz to gallons, of plastic, metal, or glass (both with proper change parts). 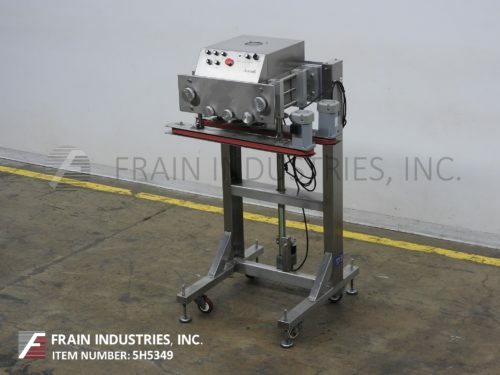 Equipped with stainless steel, container conveyor with 4-1/2" wide x 109" long plastic Delrin belt and vari-speed controller, 25" long x 1" wide single container gripper belts, hand crank adjustable and has (2) station (4) spindle non-marring cap retorquing section with adjustable torque clutches with safety guarding. Control panel has spindle and gripper on / off switches with speed control dials, raise / lower switch, pressure gauges and start / e-stop push buttons. Mounted on stainless steel "U" shape frame with leveling legs. Kiss Packaging Model VACT06, in line, 3 station, 6 quill, semi-automatic capper rated from 60 to 150 container per minute – depending on materials and application. Three sets of spindle style tightener wheels. Cap size range: 10mm to110mm. Air torque adjustment on third spindle set, individual speed adjustment on spindle and container belt speed, height adjustment on capping head, independent gripper belt height adjustment. Mounted on stainless steel base frame with casters and leveling legs. 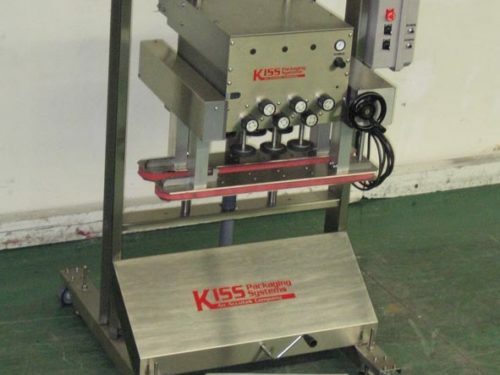 Kiss Packaging Model VACT06DG, 3 station 6 spindle, inline, semi automatic capper rated from 25 to 150 containers per minute – depending on materials and application. Cap size range of 10mm to 110mm. Equipped with 3 station, 6 spindles style cap tightening wheels. with air torque adjustment on third set with single container gripper belt with individual speed adjustment and container belt speed, with independent container gripper belt height adjustments. Mounted on stainless steel base with casters and leveling legs. Kiss Packaging Model VACT06DG, 3 station, 6 spindle semi automatic capper rated from 25 to 150 containers per minute – depending on materials and application. Cap size range of 10mm to 110mm. Equipped with (3) sets of spindle style tightening wheels. air torque adjustment on third set, with individual speed adjustment and container belt speed, with height and head, independent gripper belt height adjustments. Mounted on stainless steel base with casters and leveling legs. 3 pair spindle automatic capper with dual level belt grippers. Features air torque adjustment on 3rd spindle pair, individual speed adjustment on spindles & gripper belts, motorized height adjustment, & independent gripper height adjustment. 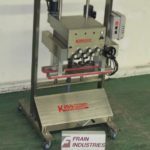 Kaps-All Model FC8, semi – automatic, stainless steel 4 station, 8 spindle capper, rated from 20 to 400 containers per minute – depending material and application. Cap size range: 8mm to 120mm, Container size range: 1oz to 2-1/2 gallons and capable of handling all types of caps including pilfer proof and child resistant, containers of plastic, metal, or glass all with proper change parts and hand crank adjustable for quick changeovers. Equipped with 36" long x 1" wide single container gripper belts, 3 station, 6 spindle non-marring cap tighners with adjustable torque clutches. Control panel with spindle and gripper belt on / off switches and speed controls dials, raise and lower switch, start, e-stop push button controls and statis light. Mounted on stainless steel base frame with casters, ment to roll over existing conveyor.